Reconnecting with an old friend can sometimes be a bit awkward – your interests may have changed, your paths diverged, old jokes gone stale. But when that friend invites you to try a bevy of whiskeys – among them the legendary Talisker 57°North – you really don’t mind. Thankfully, though, when I went to drink with my old highschool buddy in Toronto, it was as far from awkward as possible, largely aided by our mutual appreciation of a good beverage and his large selection of them. While we drank several different beers, bourbons, cocktails and scotches that night, the stand out was undoubtedly the Talisker 57°North, which as of writing, is the most expensive scotch I’ve ever tried. Of course, to readily appreciate a drink as refined as the 57°, it’s best to have a point of reference. 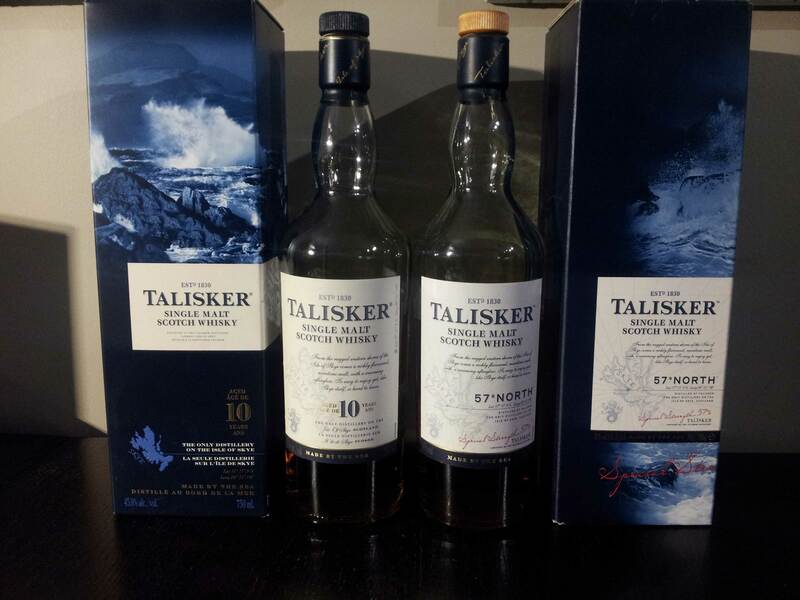 For this, we did a head-to-head with the Talisker 10 Year, the little brother of the 57°. Both are produced on the Isle of Skye, and both are reputed to bear the character of the surf-beat island. So how did these two Taliskers stack up? 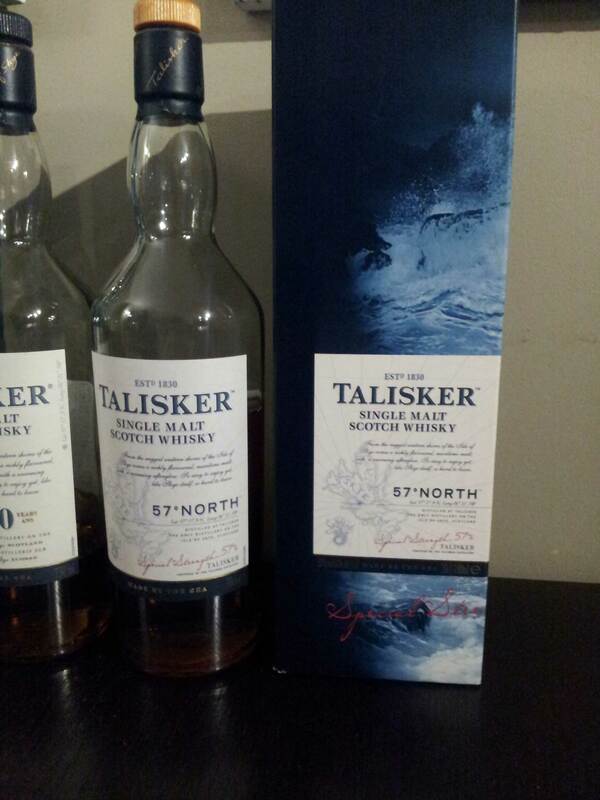 When I called Talisker 10 the “little brother” of the 57°, I didn’t mean it’s actually little. No, this big, heavy, peaty scotch is far from little – it’s actually quite big on flavour. On the nose it’s got big puffs of wet smoke, a bit of seaweed, and a fairly rich graininess to it. It’s a good smelling scotch, and you know your drinking something serious, especially when the alcohol fumes hit you (it’s 45.8% alcohol). It tastes pretty good too — any one familiar with Islay scotches knows what I mean when I say it’s richly peaty, but it also brings some potent black pepper, and even a tart fruit taste that sort of reminds me of green apples. Right at the end, there’s a bit of the brine that Talisker is famous for, and it finishes with a solid graininess. Overall, a pretty good scotch. Let me preface this by noting that no one — and I mean no one — expects the Talisker 10 to be better than the 57. Coming in at nearly $180 CAD, the 57° is roughly twice as expensive as the 10. While there is no age statement on the bottle, the 57 is rich with gimmicks, being distilled at the line of latitude 57° North (hence the name) and to a blistering 57% alcohol (hence the giddiness). But perhaps in spite of it’s shtick , the Talisker 57° North is probably the best scotch whisky I’ve ever had. The nose packs the powerful smoke of its little bro, but where the 10 may have had a dash of the sea, the 57° has an ocean. Intense notes of seaweed, fresh shellfish and salt came up supported on with a nice kind of citrus back-bone. The taste is nearly incomparable. It’s literally quite salty, which pairs nicely with the taste of clams and vegetables. It’s got plenty of solid wood in their to round it out as well (I am so tempted to say drift wood), and perhaps the best texture of any scotch I’ve ever tried. Also, despite it being cask-strength, I barely noticed the alcohol. The finish is lengthy, salty and smoky. I wish I could still taste it now. It’s quite interesting to see just what a distillery is capable of. In comparing these two scotches I felt a bit like a Honda Civic driver being asked to take out their Formula 1 car for a spin. It was an amazing experience provided by a generous friend, and I hope to repay in kind one day when the scotch gods favour me. “but where the 10 may have had a dash of the sea, the 57° has an ocean.” well said! Thanks Lyndon. Oh, and thanks for the scotch!